Do you have that “Arizona dream” that includes enjoying sunsets and starlight from your own back yard paradise? Can you picture yourself barbecuing in a complete outdoor kitchen while the family plays a game of water volleyball in a beautiful back yard pool? Does your idea of a great night start with dinner and continue with quiet conversation with your spouse next to a fire pit in the winter or a waterfall in the summer; surrounded by plants that you have grown to love? Does the perfect night end with the kids asleep while you soothe away the day in a bubbling spa? Jeremy works in the business next to his wife, Stephanie, surrounded by employees who are their friends and who they have knows since they were in high school. It is not a normal business success story. It is as unique a story as the American dream that created it. California Pools defines success or failure, not in monetary terms, but in the story that their customers tell their neighbors about their pool, their back yard, and the experience they have in getting their dream built. California Pools built a foundation of customer trust and a reputation that has served them well through the recent financial downturn and construction collapse of the Phoenix market. Swimming Pool construction has plummeted from over 25000 pools being built in 2006 to less than 3500 in 2009. “It’s a formula that is key to who we are and what we are. I laugh when people ask me now about why we continue to back our warranties and honor our customers when so many others in the industry are avoiding those costs. It is laughable to think that we would quit doing what has made us who we are and what we are,” Smith says. “We are using this time to recreate our processes and our products. We have always been the leader in creativity and design, we are now also a leader in the new technologies that save energy and reduce maintenance,” Smith says. “But we will NEVER lose our biggest commitment, to our customer. We will offer new and better products and construction techniques. 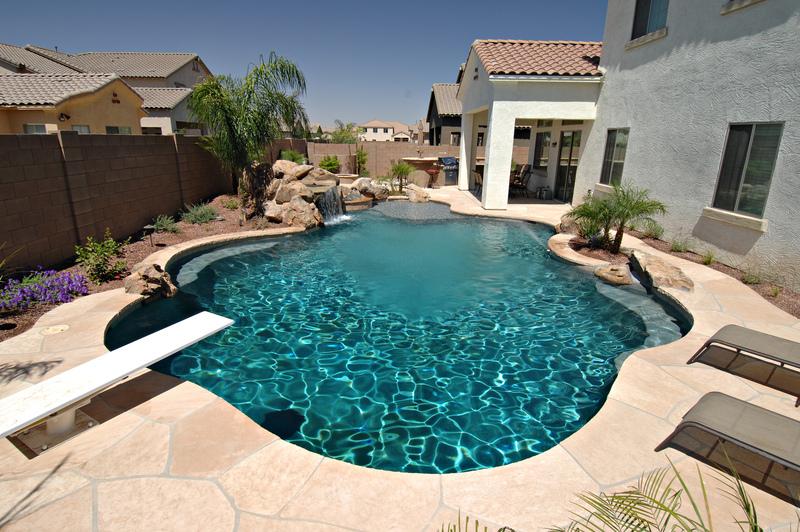 But what has that made us the #1 Rated pool company according to Best magazine and the most referred pool builder in Phoenix is one thing—our commitment to doing whatever it takes to make our customers happy with us.